Do you feel fat and frumpy? Are you constantly dieting but cannot keep the pounds off? If the answer is yes – then you need to give Lorna a call! There is no ‘ one diet suits all’. Many people go onto a diet plan that may create good weight loss only for the weight to be regained (and often extra pounds as well!!). Often the underlying issues surrounding weight gain have never been addressed and therefore the client is neither empowered, properly educated nor given a maintainable personalised plan. Some people have a complicated physiology that makes weight loss quite difficult unless they eat particular types of food. 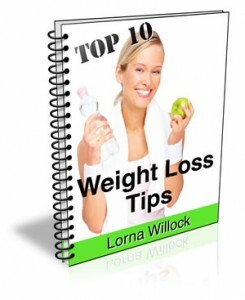 Some people have great difficulty in losing weight and it is not their fault! – they just need to understand what is going on with their body chemistry and the types of foods they can eat to lose weight reasonably easily. Gaining extra weight can make us vulnerable to diseases such as Type 2 diabetes with it’s associated complications. We need to be empowered to have weight loss that is interesting and fun rather then denial and a limited diet. Would like some advice on weight loss. Very sweet tooth, big snacker, no lover of fruit so needing advice. I think it can be really hard to get off sugar as it has a drug like effect. Taking a blood sugar balancing supplement can be really helpful when trying to come off sweet foods. I recommend a Cytoplan product called blood glucose support, plus ensure you get plenty of omega 3 from oily fish. My ‘Changes for Life’ programme has some good ideas in it for balancing blood sugar levels.